Tom Hanks is like a box of chocolates, you never know what you are going to get. When he is good, he demonstrates supreme skill as an actor, but when he is bad, Hanks can be downright annoying to the point of being insufferable. Standout turns in the likes of Philadelphia and Saving Private Ryan are interspersed with insipid romantic leads such as those in Sleepless in Seattle and You’ve Got Mail or some of the most irritating characters ever to appear on screen, including Forrest Gump, Viktor Narvorski in The Terminal and Chuck Nolan in Castaway. However, just when all hope seems lost – watching the Da Vinci Code films or Extremely Loud and Incredibly Close will have sapped you of your will to live – Hanks re-emerges in a film that restores your faith in his talents and demonstrates why he is one of Hollywood’s most enduring leading men. 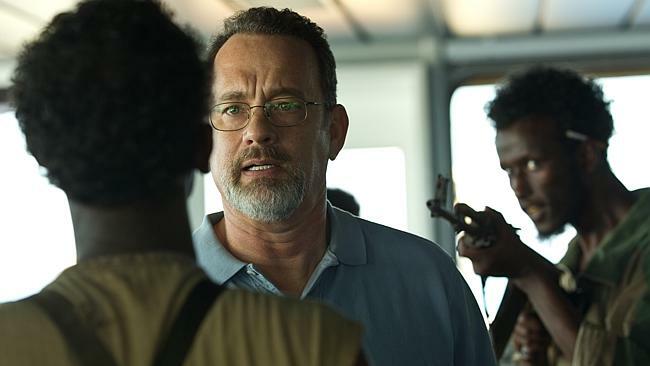 In Captain Phillips, Hanks plays the titular character whose cargo ship comes under attack from Somali pirates while traveling between Oman and Kenya. As a re-enactment of real life events from 2009, the role very much demands an everyman actor rather than an action hero-type and Hanks proves to be the ideal choice to shoulder the heavy going in this tale of what is, apparently, the first hijacking of an American ship in over 200 years. The opening moments of the film introduce us, somewhat superficially, to Phillips on dry land as he leaves America for Oman to rendezvous with his ship, the Maersk Alabama. The shots of the port and the ship being loaded are the types of which we rarely see in film and it does offer some insight into the size of these ships and the logistics of transporting this cargo around the world. Once on board, Phillips is all business and presents as a thoroughly professional and competent captain. As Phillips and crew set forth on their journey, we cut to a beachside village in Somalia where a local warlord is recruiting for crews from amongst the local fishermen whose livelihoods have been eroded by commercial fishing operations. There is no shortage of volunteers and soon a motley crew are on the water to await the first container ship that comes their way. It isn’t long before the pirates, led by the confident but ultimately clueless Muse (Barkhad Abdi), are riding in the Maersk Alabama’s wake. Whilst their initial foray is thwarted, the pirates eventually make it on board and this is where the story really begins. When one of the pirates is injured and Muse is captured by the crew while undertaking a search of the ship, the tension mounts and Phillips finds himself taken captive in a life boat as the pirates set a course for home with plans of securing a ransom. The claustrophobic confines of the lifeboat cabin are magnified by the signature hand-held shooting style of director Paul Greengrass, who was responsible for bringing other real-life stories to screen with Bloody Sunday and United 93. Whilst there seems to be a begrudging respect between Phillips and Muse, the tension inside the lifeboat reaches boiling point as the US Navy looms large in pursuit. With an extended running time, the film loses momentum on a couple of occasions before the protracted ‘negotiations’ between the navy and the pirates finally bears fruit. 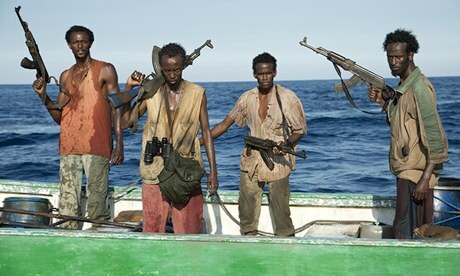 The screenplay by Billy Ray does reference the circumstances that have driven the people of Somalia to such desperate measures, which certainly engenders some sympathy towards the pirates. Whilst Tom Hanks is terrific in the lead role, this is very much a two-hander with Abdi also impressive as the pirate leader who refuses to concede defeat no matter what the odds. The various crew members – on the Maersk Alabama, the lifeboat and the various navy vessels – are solid enough in support, while the considerable talents of Catherine Keener are completely wasted as Phillips’ wife Andrea, an infinitesimal role that surely must have been something more significant at some point in the production process. Despite the inevitability of the conclusion, Greengrass maintains the tension until the end with abundant edge-of-your-seat moments in what is a highly entertaining adventure on the high seas.